This past week we got a cute text message from Rachel (the kids' babysitter). 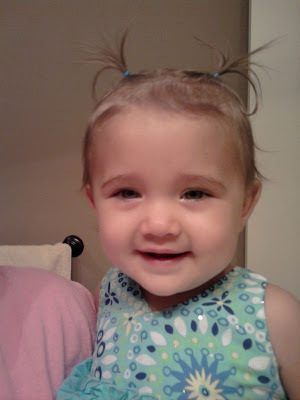 She put Paige's hair in pigtails! We thought it was a cute picture because of the pigtails and also because Andrea thought it was the first time that Paige really looked part Asian. Super cute and we were surprised Paige didn't go nuts trying to pull them out. Pretty soon our little girl may actually have girly looking hair!